BAY LEAVES. We mean the commonly available Mediterranean bay leaves, which are small and roundish. California bay leaves are long and tapered and have a much stronger taste. BUTTER. We mean salted, because that’s what most people have in their refrigerators. That said, for baking—when a precise amount of salt is critical for the best flavor—we often call for unsalted butter plus an exact amount of salt. When a recipe calls for softened butter, take it out of the fridge at least 40 minutes before using, or microwave in 10-second increments for a whole stick, less for a smaller piece, until it’s softened. If you don’t use butter often, wrap it airtight and keep it in the freezer; it keeps for up to 4 months. CHEESE. Full-fat. We do use cheeses that are naturally lower in fat (like goat cheese, for instance), but we prefer not to use naturally high-fat cheeses, like cheddar, that are processed to reduce their fat content. Their flavor and texture suffers, and they behave differently in cooking. As for cream cheese, Apart from neufchatel, we don’t recommend low-fat or nonfat cream cheeses. They are unlike full-fat in taste and texture, and they don’t behave the same way in cooking, so using them can ruin your dish. CREAM. When we call for whipping cream, we mean either regular whipping cream, which is 30% to 36% milkfat, or heavy whipping cream, which is 36% milkfat or more. Both produce a thick, stable whipped cream, but heavy cream has a richer flavor and a more silken texture. If it matters which you use, we tell you in the recipe. Look for pasteurized cream, not ultra-pasteurized, which tastes cooked instead of fresh and also doesn’t whip quite as well. Half-and-half, a homogenized mixture of milk and cream, is 10% to 12% milkfat. Sour cream is a tangy, thick, cultured light cream with a milkfat of at least 18%. Mexican cultured cream, called crema, is also a cultured product, with a gentler flavor and a pourable consistency. Crème fraîche, a French-style cultured cream, is silky and thick, with a delicately nutty flavor. EGGS. Large (about 2 oz. each in the shell), unless otherwise noted. We firmly support buying cage-free eggs, because it indicates that the laying chickens were more humanely treated. FLOUR. Unbleached all-purpose, unless otherwise indicated. 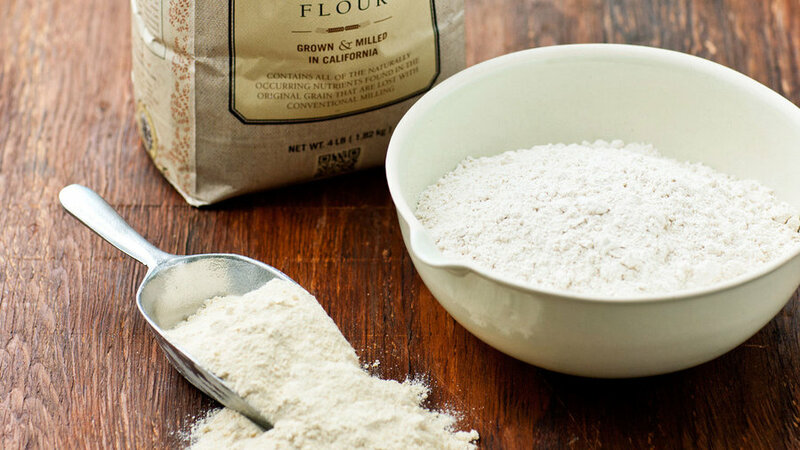 Buy fresh flour at least once a year, because it does get stale (you’ll notice a big difference in your baked goods if you use fresh). If you’ll use up a package of flour within a few months, it will be fine at room temperature in an airtight container. Otherwise, put the package in a heavy-duty resealable plastic bag and keep it in the fridge for up to six months or in the freezer for up to a year. The same principle applies to other flours too—like cake, pastry, whole wheat, and bread flours. FISH SAUCE. An essential seasoning in Southeast Asia and the Philippines, drawn from vats of whole small fish fermented in brine (ancient Romans had a similar sauce, called garum). There are many different styles of fish sauce, some saltier and funkier than others. We prefer the lighter, less pungent Thai fish sauce (nam pla) and Vietnamese fish sauce (nuoc mam). MILK. Whole, unless otherwise indicated. OLIVE OIL. In general, we use regular olive oil—not extra-virgin, the highest and most expensive grade—for cooking, because heat breaks down the flavors of the oil. Typically, we save extra-virgin olive oil for drizzling on food at the last minute or for salad dressings. PEPPER. We always mean freshly ground black pepper, unless otherwise specified. The minute it’s ground, black pepper begins to lose flavor, so when you buy already-ground pepper you may very well be spending money on a little jar of dust. Better to buy peppercorns whole and put them in a sturdy, comfortable-in-the-hand grinder that produces a lot of pepper per grind, like the PepperMate (). SALT. Although there are all kinds of terrific gourmet salts on the market, we mostly use three kinds in our cooking: table salt, kosher salt, and sea salt. Table salt dissolves quickly and disperses evenly because of its fine grains, and because of that is usually our choice for baking. Usually it contains iodine and ingredients that keep it from clumping. Kosher salt has larger grains than table salt, and we like using it for savory cooking because it’s easy to pinch and sprinkle. Also, it has a cleaner taste than table salt and is almost always additive- and iodine-free. By volume, it’s not as salty as table salt (use 1 1/4 tsp. kosher for every 1 tsp. table salt). When we call for kosher salt, we mean a flake-shaped salt like Morton. Diamond Crystal brand kosher salt has pyramid-shaped hollow crystals, making it much more voluminous than other kosher salts and ideal for salt crusts; when we mean this type of salt, we’ll call for it by name. Sea salt is made by evaporating ocean water. Its taste and texture vary enormously depending on the producer, the body of water, and how much of the natural minerals are left in; we’ve had some sea salt that’s been so thoroughly purified that it might as well have been table salt, and other salts that taste earthy or even floral. Sea salt can also range from very fine to super-coarse. SOUR CREAM. Full-fat. Low-fat and nonfat sour creams bear no relation in taste or texture to full-fat sour cream, and we don’t recommend them in cooking, because they jeopardize the results. SUGAR. White granulated, produced from either sugar beets or sugarcane, unless otherwise specified. For brown sugar, we’ll specifiy dark or light. If we don’t, then either will work equally well. VEGETABLE OIL. We like safflower and canola for their light, clean taste; our standard cooking oil apart from olive oil. VINEGAR. The tastiest red-wine, white-wine, or cider vinegars are those that say “barrel-aged” on the label. This means they’ve been fermented the traditional slow way (several weeks), and will have much more flavor than a cheaper fast-fermented vinegar (2-3 days). Certified balsamic vinegar from the Modena and Reggio Emilia provinces of Italy (aceto balsamico tradizionale) is ambrosial stuff, made by aging the vinegar in casks of different woods for at least 12 years. However, it’s not widely available and is very expensive. Decent uncertified balsamic vinegar, such as Cavalli or Elsa brands, can be found in gourmet grocery stores and online. When we say “good-quality cask-aged balsamic vinegar,” this is what we mean. It has no additives (such as caramel coloring), a pleasingly syrupy consistency, and an acceptably rich flavor. We don’t recommend cheap balsamic vinegar; it’s made with additives and doesn’t have a good flavor or texture. YEAST. Active dry yeast, sold in packets or jars. A microscopic, single-celled living organism abundant in nature, yeast is also cultivated and then dried. Each little nubbin of active dry yeast is actually thousands of desiccated yeast cells clumped together. When you mix yeast with warm water (not hot, as 140° water kills it), the cells “wake up.” When you add flour, the yeast begins feeding on the sugars in the starch and multiplying, meanwhile producing the carbon dioxide gas that makes bread rise. Keep yeast in an airtight container in the fridge or freezer. YOGURT. Plain full-fat, unless otherwise specified, and regular (unstrained) style. We often use Greek (strained) yogurt, but will specify if we do.